When exhibiting at trade shows, companies can easily get lost in the shuffle and long list of exhibitors. Two pest management companies found a way to stand out and recently made headlines for their booths. Reliable Pest Solutions exhibited at the 2016 WGEM Home & Living Show March 4–6 in Quincy, Ill., and brought some friendly pals as snacks. Each year, Reliable Pest Solutions holds a Mealworm Challenge, where attendees can chow down a small, food-grade mealworm that has been fried and spiced with “critter crunch seasoning,” reports Quincy Herald-Whig. Also featured at the pest management company’s booth were cockroach races. Two Madagascar hissing cockroaches spent their three days at the show going head-to-head. Alex Atkins, Reliable Pest Solutions’ accounts specialist, told Quincy Herald-Whig the company has had a booth at the Home & Living Show for “years.” He also said the show is a good way to meet potential customers and showcase the company’s services. Ehrlich Pest Control, a Rentokil company, had a similar set-up on March 5 at the Northeast PA Home Showcase with its Pestaurant. 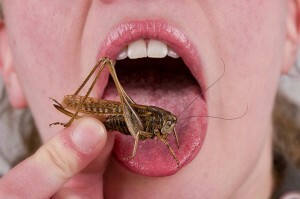 Visitors could participate in the Pestaurant Challenge, the company’s popular cricket-eating contest. In 2014, Rentokil held its first annual Pestaurant global event, where countries around the world participated. The aim of Pestaurant is to educate the public about pests while celebrating Ehrlich’s 87-year heritage in pest control, the company says. Are you exhibiting at a local show? Send a photo and details to pmpeditor@northcoastmedia.net for your chance to be featured in an upcoming issue of Pest Management Professional.